As the PS4 gets closer to its arrival at the end of this year or early next year, a slew of great games are or have come out to send off the Playstation 3 in style. So many different kinds of genres from RPG’s to platformers are coming out. We have games like Ni No Kuni, one of the best JRPG’s of this year or maybe THE BEST JRPG of this year, God of War Ascension, Sly Cooper 4, and upcoming titles like Naughty Dog’s survival game The Last of Us, and the very cool and interesting Beyond Two Souls, starring Ellen Page and Willem Defoe. Not to say that this console’s last year line-up doesn’t trump anything Microsoft has going for it, but it trumps anything Microsoft has going on for its console’s final year. Seriously, alongside Nintendo, Sony always has a good line-up of games throughout their console’s life spans. Sure, the PS3 was way too dang expensive at first, and Sony isn’t really doing well with the failing Playstation Vita, but hey, they have good and varied exclusives. Today’s Thoughts On focuses on Puppeteer, directed by Gavin Moore. The only info I could get on this guy was that he was the lead animator for Playstation exclusives like the PS2 game, The Getaway and Forbidden Siren 2, along with the PS3 remake of the first Siren game. When this game was announced, I was pretty darn excited. I mean, the PS3 already had a great platforming franchise with Little Big Planet, so why not have yet another exclusive platformer? It also seems to me that this game has a unique aesthetic of everything being like puppets, and the levels taking place on a stage. 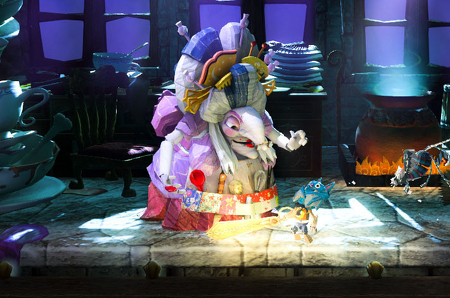 Even though we have seen this puppet and theatre look before, with games like Black Knight Sword and Twisted Pixel’s Gunstringer (still the best Kinect game), this takes it up to the next level with a beautiful art and graphical presentation, and a fun premise and gimmick. What are my thoughts? Read on to find out! 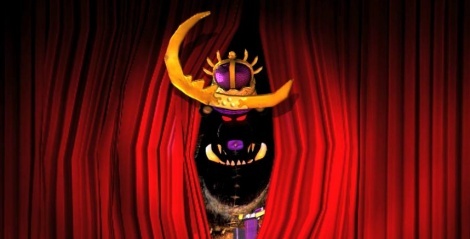 From what I can get from the trailers about the story, and from what I have read, you play as a prince named Kutaro who has been taken by this fiend known as the Moon Bear King. This villain known as the Moon Bear King was apparently very close to this Moon Princess and decided to take over the kingdom she ruled. After taking it over, Moon Bear King has been kidnapping the souls of children and turning them into puppet servants. Unfortunately for our hero Kutaro, he gets his head devoured by the Moon Bear King and tossed aside. I guess you can say Kutaro is in way over his head now. Luckily for him, a witch helps him get a replacement head for now, and sends him off on a quest to save the kingdom by getting a magical pair of scissors and the heads of the legendary moon heroes. The story from what the trailers have shown looks to be slightly light-hearted, but not really aimed at kids due to the visual aspect of the game. It isn’t really a platformer for the actual kid, but more for the kid inside the adult gamer. However, from the trailer’s breaking the 4th wall moment with the villain talking to the narrator, it looks light-hearted and not taking itself very seriously. 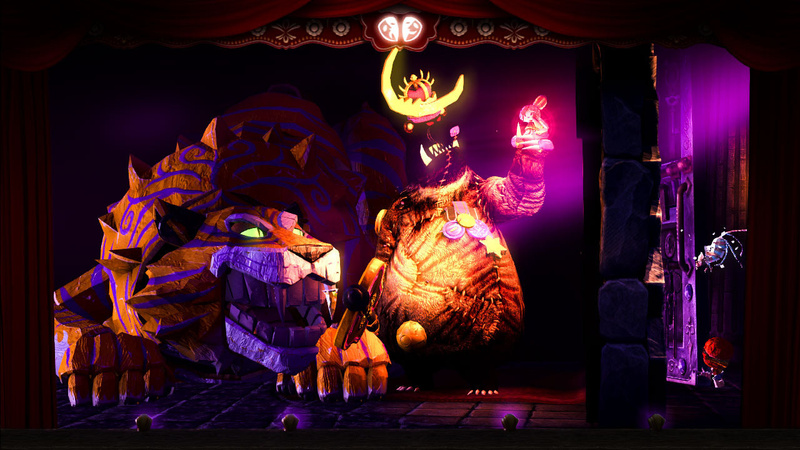 The gameplay is of a 2.5D platformer, in the same vein of Little Big Planet. You travel across 12 worlds and need to fight 12 evil generals and save the princess! 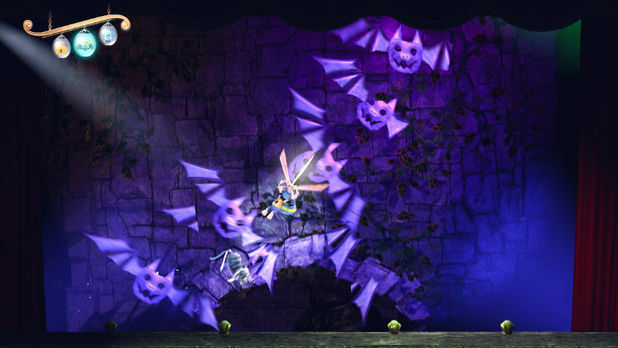 You will jump your way through levels in a very traditional way, but trailers have shown some of the more gimmicky levels that are included within your adventures. From what I have seen of the videos shown of the game, your health system is determined by the heads you collect. You can only collect 3 heads, and if you lose all three, you lose a life. However, each head can be more than a sign of your health. Each head has a small ability that can be used to do things like unlock bonus levels within the main levels. They have revealed that you will gain four special heads that are from the four moon heroes, and have special abilities to go along with them. Only two of the four heads have been revealed, along with what their abilities are. The Knight head will give Kutaro a special shield, and the Ninja head will give Kutaro the ability to use bombs. If having magical heads that give you magical abilities and act as your health wasn’t enough, Kutaro in the first level gains the powers of a magical pair of scissors that seem to have parts of levels revolve around them. You can either just cut something on the ground, or jump in the air and use them to cut things and move around at the same time. It also looks like you use the scissors on the bosses to hurt them and the normal enemies. Seems like the game is taking advantage of its stage-like setting having the levels interchange for you, like how a play would change its scene by moving everything from the background and foreground. It’s kind of cool, since it helps immerse you into the game’s creative world. It is always nice when a game developer goes the extra mile to immerse you into their game’s world. For example, in Red Dead Redemption where there is no hub besides the map, it just pulls you in more, when there isn’t a bunch of stuff huddled around your screen. I love the art style in the game. I always like it when a developer can make something like a shooter or a platformer or any genre in general look unique. Sure, the anime looks of Tales of Vesperia or the realistic look of Heavy Rain is fine and all, but when you go the extra mile and make the game unique looking, it definitely stands out. For example, compare Dark Soul’s grittier realistic look and then look at Dragon Quest 8’s more personality-given look. It just stands out more, to be honest. Same goes with this game. As I said above, its visual look is more akin to the adult gamer that is a child at heart, since I would think a lot of kids would find some of these visuals terrifying, more so than, say, Kirby or Mario. Not that it’s a bad thing, since it makes the game stand out from everything else. I just love the atmosphere the game gives the player, where it looks like you are watching one of those puppet shows. This game reminds me of other games like I mentioned above, Black Knight Sword and Gunstringer due to the whole puppet play aesthetic. So, any lingering thoughts before release? Not really. I just hope the platforming is well-designed and the controls aren’t floaty. I love Little Big Planet and its sequel as much as many other gamers do, but one of the things that is a turn-off about the series is the floaty jumping mechanics. From what I have seen, the game is requiring you to have good platforming skills to make it through the levels, since some of them look to be forced scrolling. 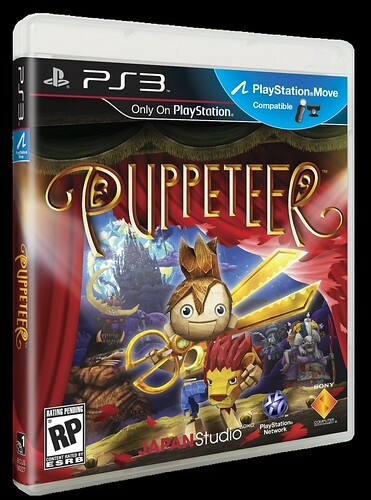 All in all, Puppeteer looks to be yet another solid game that will help the PS3 go out with style. Plus, the 40 dollar price tag is also pretty nice. Hopefully, this game does well in its overall package and in sales to warrant a sequel, since we don’t see that many big budget platformers these days. Let us hope there are no strings attached to this quirky little platformer once it’s released. Thanks for Reading!